Ohio Bingo Bugle | Ohio’s only Bingo and Gaming Newspaper featuring the Best Games in the State! Ohio Bingo Bugle, Your Comprehensive Guide to the Best Bingo in Ohio! Click on the "Game Directory" button and view our comprehensive list of advertising games all in an easy to read format. The Bingo Bugle is Ohio’s only Bingo and Gaming Newspaper featuring the Best Games in the State! Welcome to the Ohio Bingo Bugle! 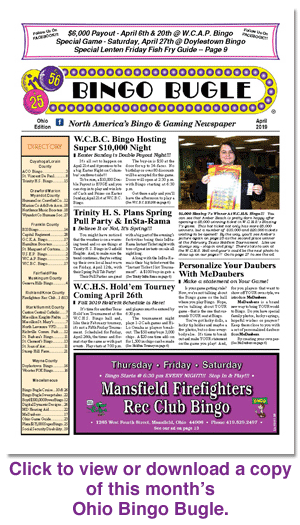 The Bingo Bugle is Ohio’s only Bingo and Gaming Newspaper featuring the Best Games in the State! The Bingo Bugle features monthly articles where you can read about new Bingo Halls opening in your area, special Bingo game events like Cosmic Bingos and Mega/Super Bingos, and major Bingo news stories from around the state that are exclusive ONLY to this newspaper. to the Best Bingo in Ohio! Click on the “Game Directory” button and view our comprehensive list of advertising games all in an easy to read format. Whether you’re looking for a game in your area or your favorite day, our Game Directory will help you find it. And, you can download and print a copy of the Game Directory to keep with you all month long! Do you Believe in Magic? Your Bingo Bugle Cruise starts with US aboard the magnificent Carnival Magic sailing from Ft. Lauderdale on November 9th, 2019. Your 8-day cruise will visit Grand Turk, La Romana DR, Curacao and Aruba - four of the Eastern Caribbean's most beautiful and spectacular destinations. And, Bingo Bugle's 30 years of experience guarantees that we know just how to bring you the best Bingo Cruise Tournament in the world! Play Bingo for more than $100,000 in Cash - PLUS A FREE CRUISE!!! Bingo, Blackjack, Sizzling Slots and Texas Hold'em Poker Tournaments...what a Magical way to spend Your Vacation!!! The One, The Only, The Original World Championship Bingo Tournament and Gaming Cruise from the Bingo Bugle. The Largest Bingo and Gaming Publication in the World! With a network of over 50 publications in the U.S. and Canada, the Bingo Bugle Newspaper Group is the largest Bingo and Gaming Publication in the World! When traveling across the country you can use our Publishers’ Hotline & Information Numbers to check on available games and times in your destination’s area. To find this listing, click on the “Bingo Bugles Nationwide” button where you will also find links to a number of local Bingo Bugle websites. The Publishers’ Hotline list is always available in our monthly Ohio Bingo Bugle editions.